Following last year’s pattern, the top 100 JEE (Advanced) rank holders have opted for IIT-Bombay, -Madras and -Delhi this year, with most of them choosing computer science. Girls, for whom a 14% supernumerary quota has been created in the premier technical institutions this year, too followed a similar choice pattern during the first round of allotment on Wenesday. Over all, around 60 of the top 100 rank holders opted for various courses at IIT-Bombay-just like 2017, but a little lower than the previous year’s 67. A large number of them, including the all-India topper and the girl topper (AIR 6) opted for computer science. The admission for IIT-B’s computer science course, which has 110 seats, closed at AIR 59 for general category. For girls, it closed at 173. A few of the top 100 rank holders also picked electrical engineering and engineering physics. For instance, the student with AIR 43 picked electrical engineering at IIT Bombay. At IIT-Delhi too, computer science was the top choice, with the all-India 3rd rank holder opting for it. Computer science admissions for general category closed at AIR 100. IIT-Madras also saw its computer science course attract some top 100 candidates. The course’s admission opened at AIR 51 and closed at AIR 200. The only other IIT that attracted candidates from top 100 is IIT-Kharagpur, where the 92nd rank holder joined computer science. IIT-Kanpur opened admissions at rank 103 in computer science. Among the younger IITs, Hyderabad was the hot pick as its admissions opened at AIR 445 in computer science- up from AIR 522 last year. In comparison, IIT-Bombay’s mechanical engineering admission opened at AIR 305 and at IIT-Delhi it was AIR 545. Last year, IIT-Madras’ mechanical engineering admissions opened at AIR 163 and at IIT-Bombay it was AIR 297. Aiming to fill 14% of seats in every course with girls, the IITs, NITs and IIITs put out a separate list for girls who opted for the supernumerary quota. Girls who did not opt for the quota were named in the gender neutral lists for every category. “While many girl toppers could have opted for the gender neutral category first, they have chosen a seat in the girls only list,” said a JEE chairman. “We have a set hierarchy that we have followed, but if a candidate opted for the females only category first, it is their choice,” said professor Ml Sharma, IIT Roorkee JEE chairman. 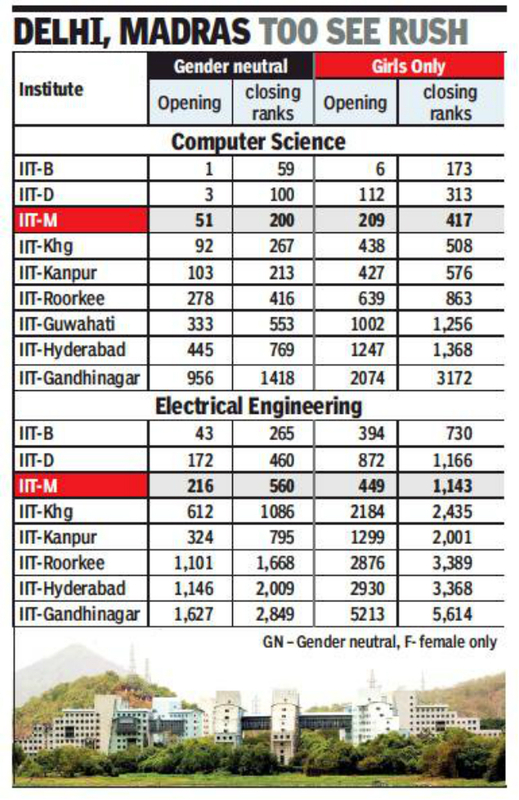 The IITs have allotted more seats than the last year’s total capacity in order to meet the programme-wise 14% criteria. For instance, at IITB’s aerospace engineering had 5 girls last year, but to meet the 14% norm, the institute has shortlisted 9 girls this year. In all, approximately 1.3 lakh candidates filled their choices through the Joint Seat Allocation Authority (JoSAA) and their total number of choices was around 2 crore.